A One-Man Play by Ray Goodwin. The Mackinaw Area Public Library is pleased to announce the return of Raymond Goodwin, writer and performer of “The Last Man in Merrinsville” and “The Wreck of The Gimpy Gin”, with a new one-man theatrical production on Wednesday, August 29, 2018 at 7 p.m. 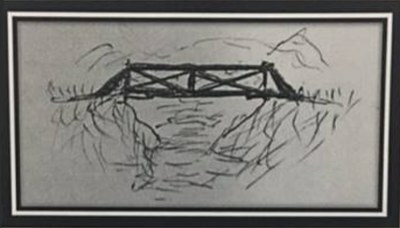 In "Mr. Kricky's Bridge", Mel Dyers has sold the old truss bridge on the family property for salvage. His sister, Barbara, using an argument that extends back to the Civil War, tries to get him to change his mind. It’s the fixings for a ghost—and a love—story. The show is about thirty-five minutes in length.